How to build a cantenna | So, you wanna build a cantenna? So, you wanna build a cantenna? Below, you will find my cantenna build diary. A quick search of the web will show that there are many ways to create a cantenna and even more materials one can use. I will address each step of my build in detail and provide accompanying photos to help you complete your cantenna build. 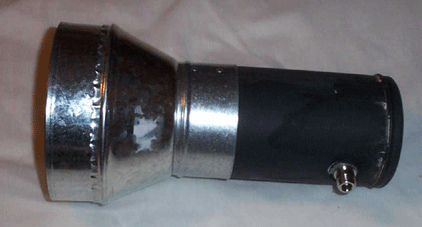 While there are many websites documenting a cantenna build, I felt that most either made assumptions as to an individuals technical/mechanical ability and/or left out important steps and info such as connector and pigtail types and how to test the performance of your finished cantenna. To address these shortcomings, I will show you how to build a cantenna step by step and hopefully leave nothing out that you may have questions about. A pigtail to connect the cantenna to your router. 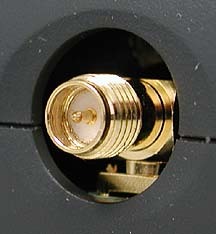 You will need either a RP-SMA or a RP-TNC connector to N-male. Check your routers manual for the correct external antenna connector type..
For my cantenna build I used Rob Flickenger’s 36 oz. coffee can design for inspiration and reference over Andrew Clapp’s Pringles can design. The reason behind this was simply the potential for greater performance. 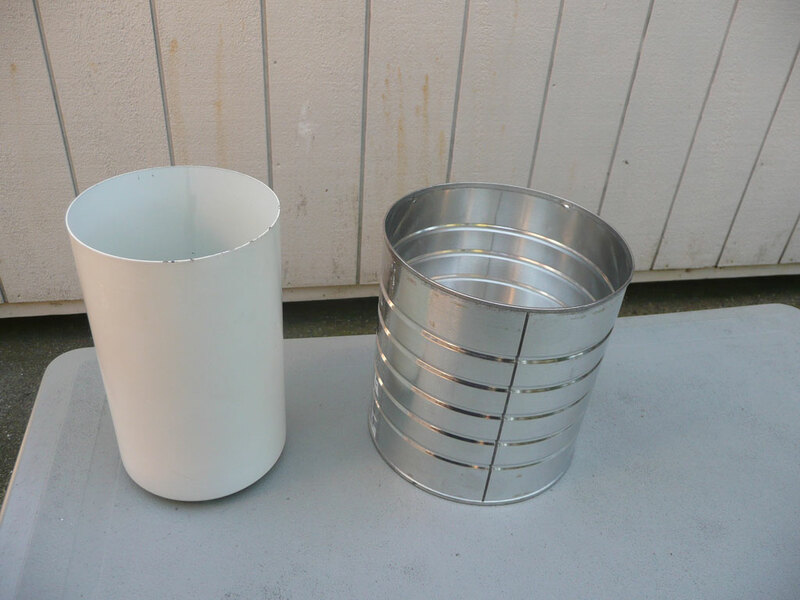 After days of researching various cantenna designs based off of different can diameters and lengths, I chose the coffee can route due to its potential for greater dbi increase, ease of construction and the non-ridged surface inside of the can. Your choice of can is perhaps the most important design consideration you will make when building a cantenna, right after placement of the n-connector. Pretty much any can between 3 and 6 inches will do. Beyond that there is a considerable roll off in performance. The 36 oz. coffee can I chose was an MJB brand and had a diameter of 6.1 inches exact. 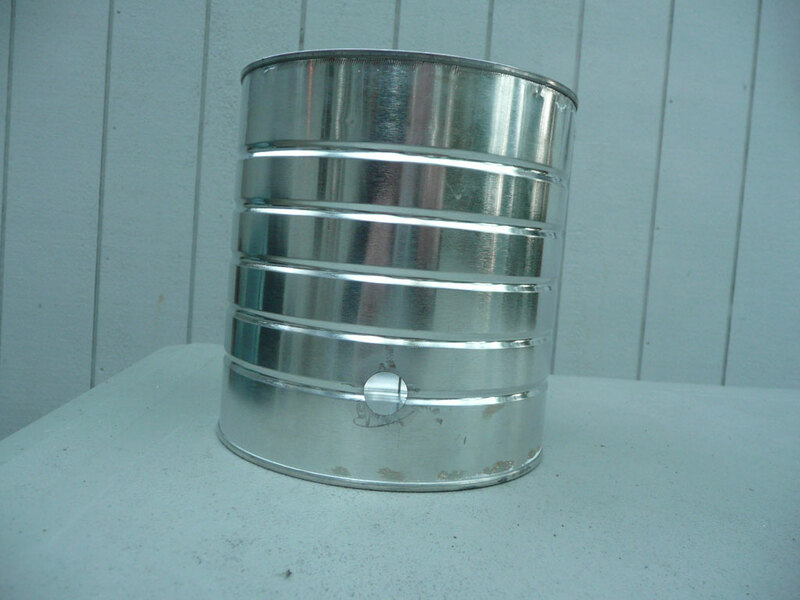 Reports from the web have found that Nally’s Big Chunk Chili cans work good as does 4 inch stove pipe. Whatever can size or type you choose, try to avoid the ridged cans if at all possible as I have read that these can cause the signal to scatter. I am not sure how accurate this anecdotal info is but better safe than sorry. 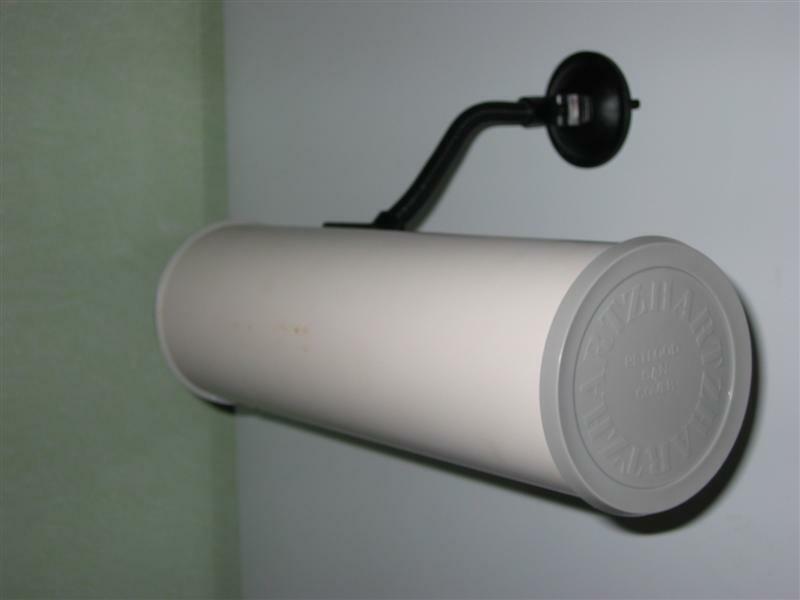 Your cantenna also needs to be made of a metal material, not plastic or glass. After choosing an appropriate can. We need to make a hole for the n-connector that the pigtail attaches to from your router/wireless access point. The n-connector I had required that a .60 inch hole be drilled in the side of my can. Where we drill this hole vertically is critical as it helps determines wavelength. In order for your cantenna to send or receive signals in the 2.4 ghz range that wireless B and G uses, you will need to input the diameter of your can into a free calculator such as this one. This calculator takes the diameter of your can and tells you where to drill the hole vertically for your n-connector. Mine was 1.38 inches from the bottom of the can. I simply used a piece of masking tape and placed a mark at the exact spot indicated. I then used a cordless drill to make a starter hole. Following that, I used a half inch drill bit to finish the hole for the n-connector. I ended up needing to used a Dremel tool to smooth out the burrs and enlarge the hole slightly for my n-connector to fit nice and tight. Here is a easy to use, freeware program for Winxp, Vista and Win7 that will calculate the proper dimensions for a cantenna. After drilling the hole in the side of the can at the correct place, all you need to do is place the n-connector into the can and attach the pigtail to your router/wireless access point. Easy wasn’t it? Next, we will look at connector types so that you know which types go to your router. 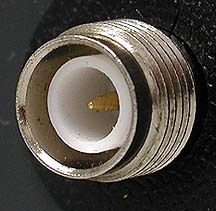 Below is a typical N-connector. To connect your cantenna to your wireless router/access point you will need a pigtail. A pigtail is a low-loss cable that has a N female connector on one end and either a reverse polarity SMA or reverse polarity TNC connector on the other. DLink, Belkin and Netgear have standardized on RP-SMA connectors for their detachable antennas. Cisco, Linksys and Buffalo most commonly use RP-TNC connectors for their removable antennas. You will need to purchase a pigtail with the proper connector for your wireless router. Simply remove the detachable antenna from your wireless router/access point and match it up with one of the examples below to know which connector type you have. On a final note, when purchasing a pigtail try to purchase as short of length as you need and look for a LMR-400 rated cable to assure minimal signal loss. 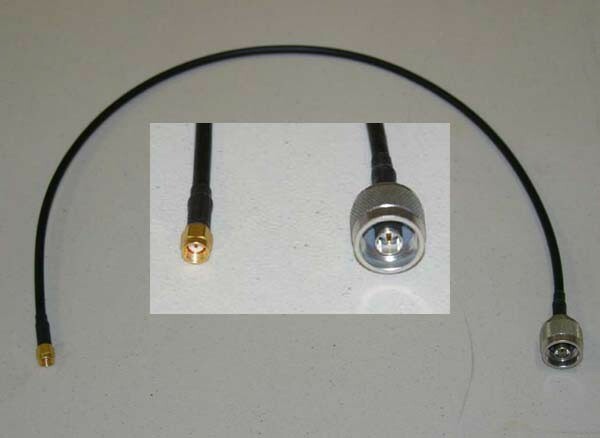 LMR-200 cable losses .5 dbi every meter of length. If you will be mounting your cantenna outdoors, be sure to purchase a cable with a surge arrestor to protect from lighten strikes. The cost is only a few dollars more for the increase in safety. Now that you have built your cantenna and have connected it to your wireless router/access point you probably want to test its performance. Simply remove your stock antenna and connect the other end of the pigtail to your router. 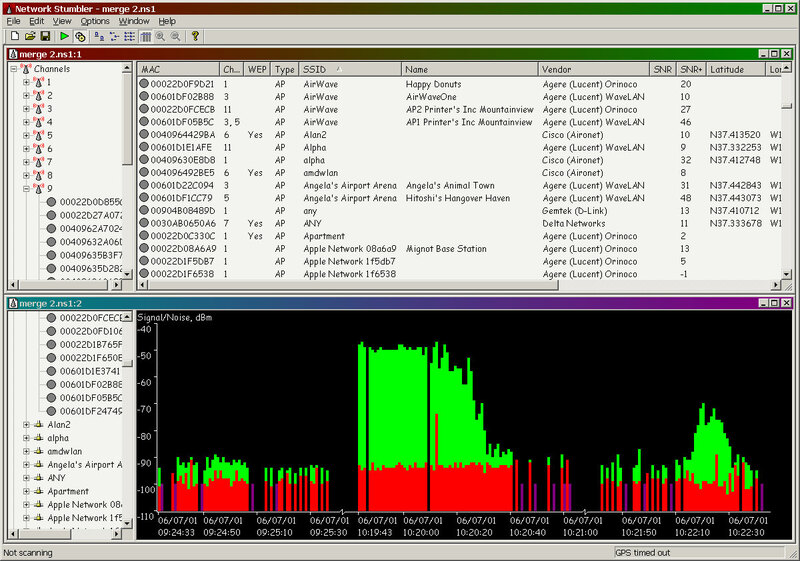 I used Netstumbler for measuring signal strength and signal to noise ratio and it worked very well. You can also use the software that came with your router. Simply look for the dbi and signal to noise ratio readings. Netstumbler provides a nice graphical representation of these values that makes testing a breeze. I hope you have a great experience building and testing a cantenna. It is a lot of fun and a very worthwhile project. My cantenna has been put to use beaming my wireless signal through a concrete floor that a normal router can not penetrate. Not bad for a $20.00 project! Now that you have your cantenna built and tested, what else can you do to make it even more cool and usable? How about attaching a pistol grip handle for wardriving/bluesnarfing or mounting it to an adjustable base? You could also attach a funnel to increase its output. A meager 3 db increase equates to a doubling of signal strength! The sky is the limit, use your imagination. Below are a few photos of cantennas from around the web that have been upgraded and made more usable. 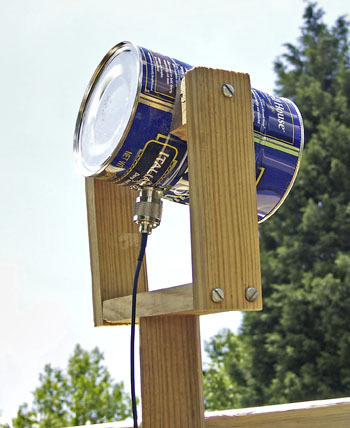 Coffee Can Cantenna with homemade rooftop mount. A surge arrestor is required for this outside application. I saw your web page, and started to build some large-size antennas on my own now. I am adding a link to my website, where you can see some first photos. The device you are seeing there, is the container. It is huge – it can take a helical antenna of 1.30 m length in its main fuselage. 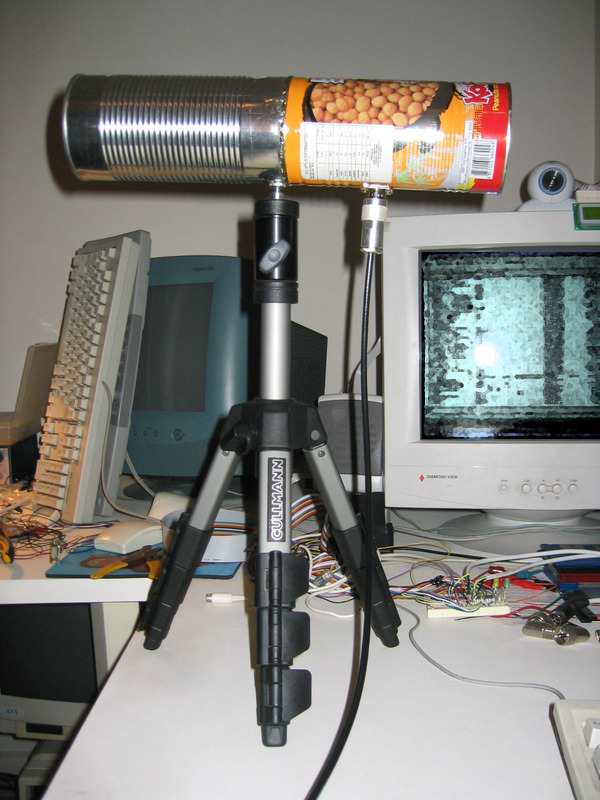 It is modular, and can carry a wide range of antennas. The regular “armament” is thought to be two YAGI antennas (each 25 dBi) at the main fuselage in front, two cantennas (each maybe 10 dBi) inside the back part of the main fuselage, and up to three helical antennas (each 15 to 30 dBi) around the center piece (top, left, right). It is 1.35 m long, 1.25 m tall, and 0.25 cm wide. Connectable to any USB port. Inside the central part is a bay with the USB WiFi adapter (closer to the antennas prevents decibel loss with the SMA cables), and SMA splitters. The addition of antennas gives a better signal strength. Here’s the link. If you wish to use the photos on your website, feel free to do so. Just mention my name, thanks. Subscribe to my blog for the latest Cantenna updates!!! Sign me up for new cantenna info!